Protex Pro/Gro Solid Seedling Protectors Protex Pro/Gro tubes come in flat sheets and are assembled with die cut tabs and slots. Put together they measure 4" in diameter x 18", 24", or 36" tall. The light blue poly material allows sun to penetrate and can accelerate photosynthesis creating the mini greenhouse effect. 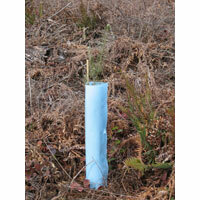 They are great for protecting seedlings against deer, elk and rabbit browse. Like our mesh tubes they are anchored with a bamboo stake or cedar arrow shaft stake (not included). Since the degradation rate is long your Protex tube can be removed to use again. Install SHINY side out. 25 piece minimum. Orders of less than a full box may have an additional 3.00 broken box charge added to the invoice.